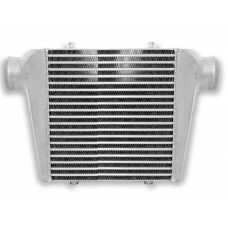 The new 2015 Intercooler Series provides you with a new generation cooling core at best price-performance ratio. The new competition core convinces with accurate processing and best cooling result with extremely low counter pressure. While old Bar-and-Plate cores already have been replaced by Fin-and-Tube cores our new Competition cores replace the ordinary Fin-and-Tube. The very light cooling cores have inner turbulators for an optimal cooling effect as well as lamellar structure for perfect usage of the airflow. An excellent balance regarding cooling effect, weight, robustness and price. The casted Aluminium Tanks are made of 3mm thick Aluminium cast and can resist highest boost pressure. The 2015 Models have matt instead of polished housings. 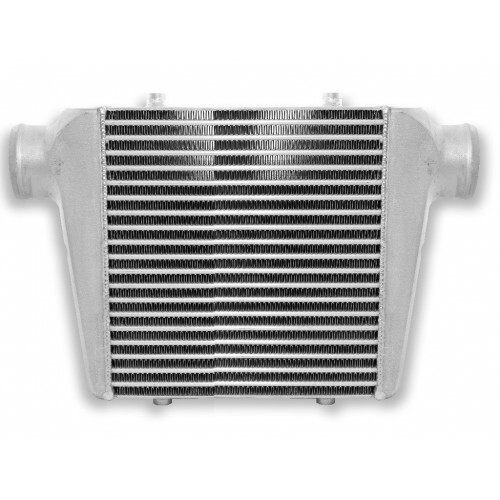 All Intercoolers are tested to withstand 5 Bar pressure. * The Core size given in the name is a measurement for comparison to common Bar-and-Plate Intercoolers. The new Fin-and-Tube Cores have smaller cores due to their construction, which give an advantage regarding the weight and responding qualities (smaller volume). The Fin-and-Tube Cores are smaller in reality but their size is still comparable to Bar-and-Plate because the difference in volume is balanced due to the better cooling effect. You'll receive with a 1:1 swap a better performance and response quality!